I frequent a local Mexican Taqueria probably twice a week. Please don’t judge me. There is something about the vibe, the people, and the food that completes my day. I often kick myself when I leave from these lunch spots because I typically default to tacos. I love tacos, and again, please don’t judge me. But while I wait for my tacos, which doesn’t take long at all, I gaze at what others are ordering, and then I question my order. One particular week I was just stunned by this bowl of soup that a couple of locals ordered and I had to question my waitress as to what they ordered. As I always do, I make every attempt to use the Mexican language that I took for about 10 years of my life, and found out that it was a Mexican shrimp and fish soup. Heck, I did not even pay attention to my tacos during my lunch. I was paying attention to the soup that these locals were slurping, and eating. They were pulling out whole, cooked, shrimp while at the same time slurping on this delicious broth and taking down tender vegetables. 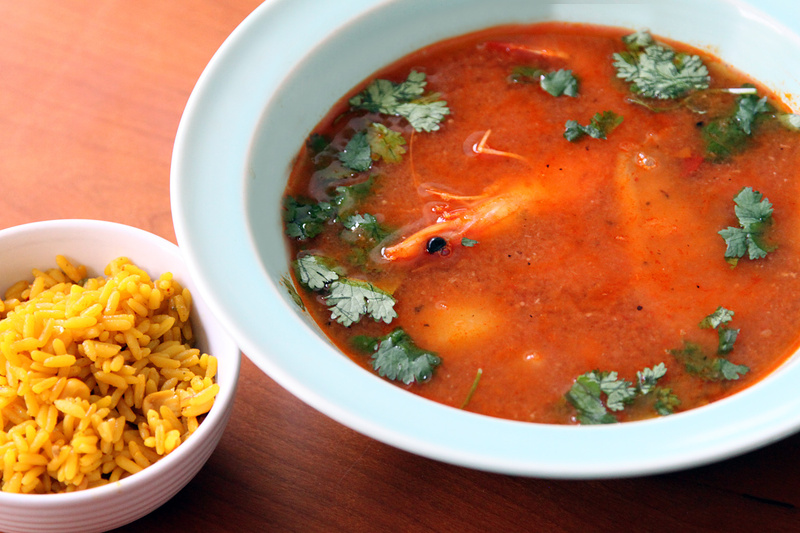 I was all over that stuff and decided to make this Mexican shrimp and fish soup for my weekly soup. This soup reminds me of comfort and simplicity, and it is loaded with this awesome seafood flavor. It’s a true delight. The soup itself is really simple, but pretty complex in flavors. It actually reminds me of a mix between an Italian cioppino and a Mexican chicken tortilla soup and I love everything about those two! Start by heating the oil in a soup pot on medium heat. Add in the onions and sweat those down for about 7 minutes, stirring along the way. Toss in the garlic and whole chilies. Give that another good stir, and cook for a few more minutes. Add in the fire roasted tomatoes, and about a cup of stock. Stir, then add this mixture to a blender. Blend until smooth, and strain the mixture back into the soup pot. This will remove any of the chilies that did not blend. Add in the carrots, potatoes, and fish fillets. Stir, and bring to a boil, then reduce the heat to low, cover, and let this cook until the potatoes are slightly tender. During this time, make the rice if you are going that route. I always see the locals at the Taqueria eating their soup with some rice, and warm tortillas. They know what’s up so that is the route that I take. Once the potatoes are tender, add in the whole shrimp, shells and head. Yep, the whole thing. If you are not into that then by all means just use cleaned shrimp. I like the experience and flavor so I keep them whole, but clean them of their dirty vein before throwing them in. Let those shrimp poach for a few minutes. They don’t take long. Then get your ladle out and get that soup into a bowl. Make sure you get everything. The fish will fall apart so don’t worry. Shower some fresh cilantro and lime juice on top, and serve alongside some hot Mexican rice, and get a few tortillas ready as well. The result is a soup so comforting on a cool day. It’s really a perfect seafood soup and one that I was glad to gaze at during my lunch last week. I hope you enjoy!